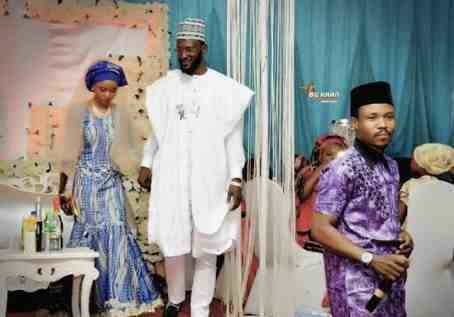 Nigerian actor, Saeed Mohammed popularly known as Funky Mallam has married again three years after his ex-wife asked for a divorce. Saeed known for interpreting his Hausa roles with dexterity, married his hearthrob who bears same name with his ex wife, Aisha, last week. He took to his Instagram page to share photos from their wedding and wrote:''No words will or express gratitude to you all that made my wedding electrifying and colorful. In fact, let me just say a big THANK YOU and shut up Saeed and his ex-wife, Aisha were married for 3 years and have a son together. According to Saeed, she moved out of their matrimonial home due to ''problems of incompatiblity''. He tried to persuade her but she refused to stay back because ''she wasn't getting what she expected from the marriage''.